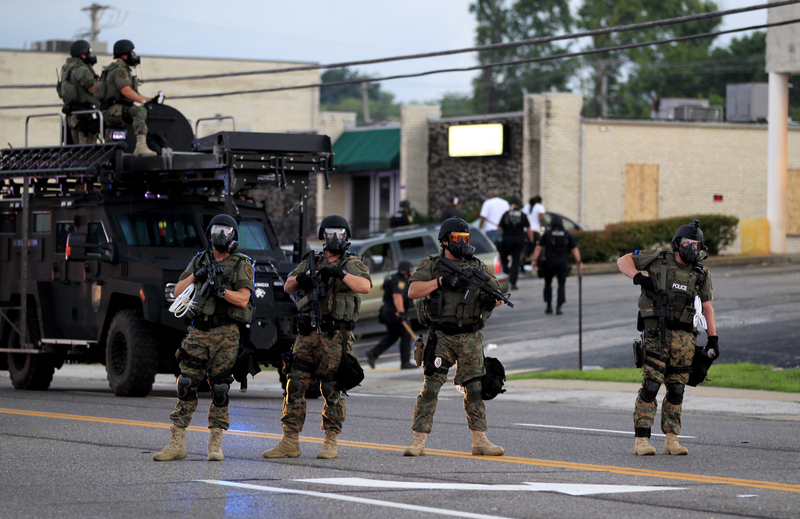 Will Congress Finally Put a Dent in the $4.3 Billion in Surplus Military Equipment Going to Police Departments? Senator Claire McCaskill will convene a hearing on Tuesday before a Homeland Security and Governmental Affairs subcommittee. Congress returns to Washington this week, one month since the shooting of Michael Brown and the ensuing police crackdown on protesters in Ferguson, Missouri. Right away, lawmakers will address one of the many civil-rights issues highlighted by the tragedy: the militarization of local police. Senator Claire McCaskill will lead a hearing on Tuesday before a Homeland Security and Governmental Affairs subcommittee to examine how police are using the military equipment they get from the federal government, what equipment is really necessary, and gaps in oversight and training. The hearing will focus on the Pentagon’s 1033 program, which has provided $4.3 billion in surplus military equipment to local police around the country since 1997, as well as grant programs run by the Department of Justice and the Department of Homeland Security. According to the Center for Investigative Reporting, the grants have enabled local law enforcement to purchase $34 billion in weaponry since the September 11, 2001, attacks. How Police Became Soldiers, a new short film from Brave New Films, explains in more detail how small-town cops ended up with grenade launchers, assault rifles and armored vehicles. Scheduled witnesses for Tuesday’s hearing include officials from the Pentagon, the Department of Justice and the Federal Emergency Management Agency; representatives from the NAACP, the Police Foundation and the National Tactical Officers Association; a professor of justice studies; and a photographer for The St. Louis American who witnessed the police response in Ferguson. The road from the hearing to legislative action will be a long one, particularly with the midterm election consuming many lawmakers’ schedules and attention. The Hill reports that Republican Senator Rand Paul is considering introducing legislation in the Senate. In the House, Representative Hank Johnson is planning to introduce a bill later this month that would ban the transfer of specific weapons—including grenade launchers and some armored vehicles—through the 1033 program and enforce stricter reporting requirements. If such legislation were to pass, it would mean that events in Ferguson provoked a real shift in the mindset of lawmakers from both parties. In June the House rejected a similar proposal introduced as an amendment to the defense spending bill by a resounding 355-62. Even in the Democrat-controlled Senate, the prospects for an overhaul of the weapons transfer program are slim. In an August interview, Senate majority leader Harry Reid said that he thought it should be continued, although with greater oversight. “We have police departments all over the country, including those in Nevada, who are desperate for more resources. And the mere fact that you have the equipment doesn’t mean that you have to use it,” Reid said.